Geronimo Creek has been monitored by GBRA as part of the Clean Rivers Program since late 1996. The creek was monitored at the SH-123 crossing until August 2003, at which time the routine monitoring site was moved to the Haberle Road crossing. The new site was a past TCEQ monitoring site and an ecoregion reference site. 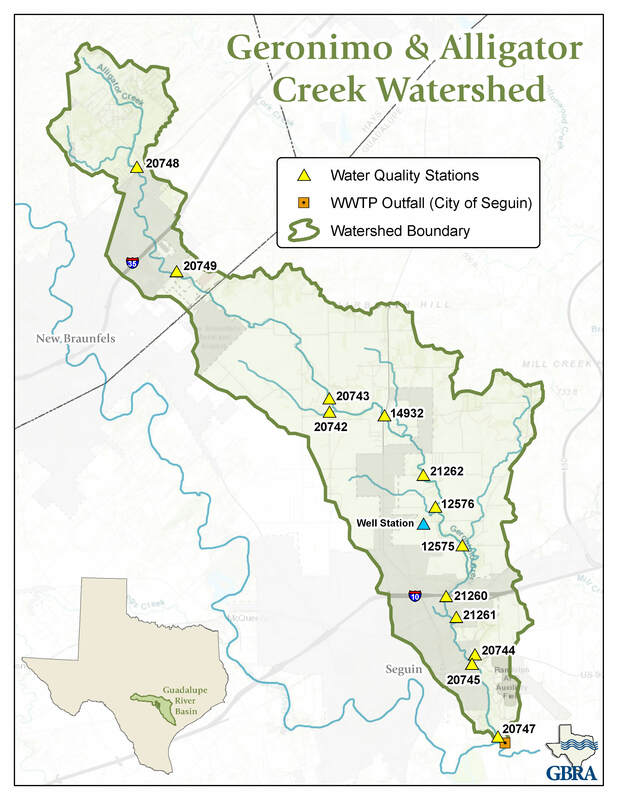 The 2008 Texas Water Quality Inventory has Geronimo Creek, Segment 1804A, listed with a concern due to elevated nitrate-nitrogen concentrations because all 60 measurements exceeded the screening level of 1.95 mg/L. In addition, the stream is listed as impaired because the geometric mean for E. coli bacteria (162 organisms per 100 milliliters) exceeded the contact recreation stream standard of 126 organisms per 100 milliliters. GBRA is currently monitoring and collecting additional data at 19 sites throughout the watershed. There are three historical monitoring sites that are identified on the map below. Using the map below, click on a station to get information on the location and a link to the current data collected at the site. Alternatively, you can also view a list of sampling sites. Using the list below, click on a link in the Data Table column to get the current data collected at the site. Alternatively, you can also view a map of sampling sites. Field Parameters are those water quality constituents that can be obtained on-site and generally include: dissolved oxygen (DO), conductivity, pH, temperature, stream flow (not in reservoirs), and secchi disc depth (reservoirs only). Dissolved Oxygen indicates the amount of oxygen available in the stream to support aquatic life. DO can be reduced by the decomposition of organic matter. Conductivity is a measure of the water bodyï¿½s ability to conduct electricity and indicates the approximate levels of dissolved salts, such as chloride, sulfate and sodium in the stream. Elevated concentrations of dissolved salts can impact the water as a drinking water source and as a suitable aquatic habitat. pH is a measure of the hydrogen ion concentration in an aqueous solution. It is a measure of the acidity or basic property of the water. Chemical and biological processes can be affected by the pH. pH can be influenced by dissolved constituents, such as carbon dioxide and by point and nonpoint source contributions to the stream. Temperature of the water affects the ability of the water to hold dissolved oxygen. It also has an impact on the biological functions of aquatic organisms. Stream Flow is an important parameter affecting water quality. Low flow conditions common in the warm summer months create critical conditions for aquatic organisms. Under these conditions, the stream has a lower assimilative capacity for waste inputs from point and nonpoint sources. Conventional Parameters are typical water quality constituents that require laboratory analysis and generally include: nutrients, chlorophyll a, total suspended solids, turbidity, hardness, chloride, and sulfate. Nutrients include the various forms of nitrogen and phosphorus. Elevated nutrient concentrations may result in excessive aquatic plant growth and can make a water body unfit for its intended use(s). Chlorophyll a is a plant pigment whose concentration is an indicator of the amount of algal biomass and growth in the water. Total Suspended Solids indicate the amount of particulate matter suspended in the water column. Turbidity is a measure of the water clarity or light transmitting properties. Increases in turbidity are caused by suspended and colloidal matter such as clay, silt, finely divided organic and inorganic matter, plankton and other microscopic organisms. Hardness is a composite measure of certain ions in the water, primarily calcium and magnesium. The hardness of the water is critical due to its effect on the toxicity of certain metals. Typically, higher hardness concentrations in the receiving stream can result in reduced toxicity of heavy metals. Chloride and Sulfate are major inorganic anions in water and wastewater. Numeric stream standards for chloride and sulfate have been set on all of the classified stream segments in the basin. Both of these inorganic constituents can impact the designated uses and can come from point and nonpoint sources, such as wastewater discharges, oil field activities, and abandoned flowing wells from groundwater with elevated concentrations of dissolved solids. Bacteria, specifically the E. coli bacteria, is used as an indicator of the possible presence of disease-causing organisms. Biological and Habitat assessment includes collection of fish community data, benthic macroinvertebrate (insects) data, and measurement of physical habitat parameters. This information is used to determine whether the stream adequately supports a diverse and desirable biological community. The physical, chemical and biological data are used together to provide an integrated assessment of aquatic life support. 24 Hr DO studies perform measurements of DO in frequent intervals (e.g. one hour) in a 24-hour period. The average and minimum concentrations in the 24-hour period are compared to corresponding criteria. This type of monitoring takes into account the diurnal variation of DO and avoids the bias in samples taken only at certain times of the day. Metals in Water, such as mercury or lead, typically exist in low concentrations, but can be toxic to aquatic life or human health when certain levels are exceeded. To obtain accurate data at low concentrations, the GBRA uses special clean methods that minimize the chance for sample contamination and provide high quality data. Organics and Metals in Sediment could be a source of toxicants for the overlying water, though currently there are no numeric sediment standards.